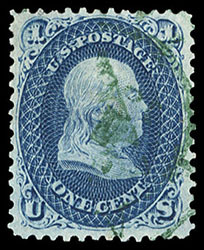 1861, 1¢ dark blue, green cancel, rich color and attractively centered, added perf tip at top left, Very Fine appearance; with photocopy of 2006 P.S.E. certificate. 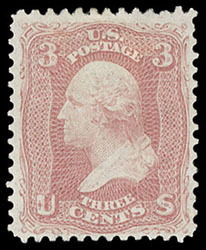 1861, 3¢ rose pink, full o.g., strong bright pastel-like color, fresh and Very Fine. 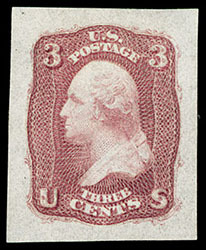 1861, 3¢ N.B.N.C. "Premiere Gravure" essay, in deep red, complete design, small die on pale cream soft wove, o.g., rich color, Very Fine, very scarce. 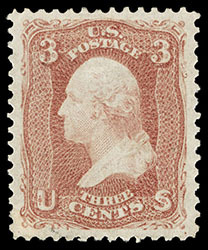 1861, 3¢ rose, full o.g., wonderful centering amid large well balanced margins, brilliant color and remarkable freshness, Extremely Fine to Superb, an exceptional mint gem, with only three examples obtaining this grade and only four higher; with 2006 P.S.E. certificate Graded (XF-Sup 95, SMQ $700). 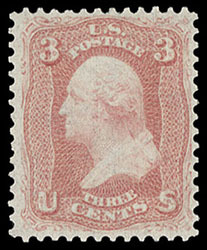 1861, 3¢ rose, o.g., never hinged, nicely centered, strong bright color, Very Fine, a scarce never hinged stamp; with 2000 P.S.E. certificate. 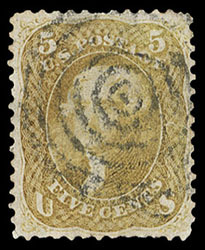 1861, 5¢ buff, brown yellow and olive yellow shades, small waffle grid, red grid and target cancels respectively, nicely matching centering and strong distinctive colors, flaws hardly detracting, F.-V.F. appearance; each with P.S.E. or P.S.A.G. certificate. Scott No. 67, 67a, 67b $6,600. 1861, 5¢ buff, Cincinnati, O. town cancel, rich bright color, Very Fine; with 1988 & 2017 P.F. certificates. 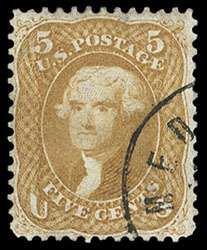 1861, 5¢ brown yellow, neat face-free town cancel, rich distinctive shade, Fine and attractive, a tough stamp in sound condition; with 1999 A.P.S. certificate. 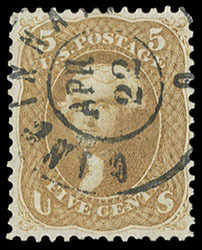 1861, 12¢ black, without gum, strong color, F.-V.F. 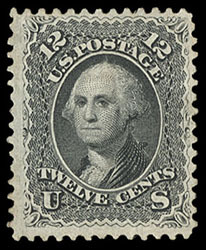 1861, 12¢ black, light segmented cork cancel, beautifully centered amid large well balanced margins, deep color and sharp proof-like impression, Extremely Fine; with 2008 P.S.E. 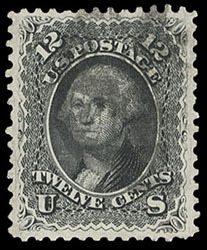 Graded certificate (XF 90, SMQ $375).